Players may be added by clicking the + icon on the Players tab. The nickname is used to identify the player on the scorecard and in player picklists. It is best kept short (it's limited to 10 characters) and it must be unique (i.e. players must not share nicknames). The handicap/handicap index value entered for the player is the value that will be initially assigned to the player when they are added to a round (Note: this may subsequently be manually amended if required). 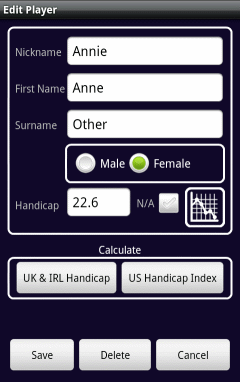 When Quickscore+ is being used in 'USGA mode' then this value will be used when calculating the course handicap. If a player does not currently have a handicap or handicap index then the N/A checkbox may be ticked. When a player with an N/A handicap is added to a round then the default handicap/handicap index configured within Preferences will be initially assigned to them for the round. The player's gender plays a part when determining the tee to which a player will initially be assigned when added to a round (within Preferences default male and female tee colours may be configured). This may subsequently be manually changed for the round. In certain cases, the gender also has an impact when calculating a USGA handicap index. To view the playing statistics for a player, click the Chart button. For details see here. Note that if a player is deleted then all scorecard data associated with the player will also be removed.